If you're in a hurry and pinching pennies, we recommend this quick, inexpensive Mexican food source. It's hard to beat cheap, quick, close, and generous portions. Now if you take a look at their Yelp reviews, you'll get a variety of opinions about the food. We enjoyed the breakfast foods we had -- machaca with eggs, and chorizo with eggs. Each plate cost $5.75. Both came with beans, rice, tortillas and red and green salsa. The beans, rice, tortillas, and salsa were plain and tasty. 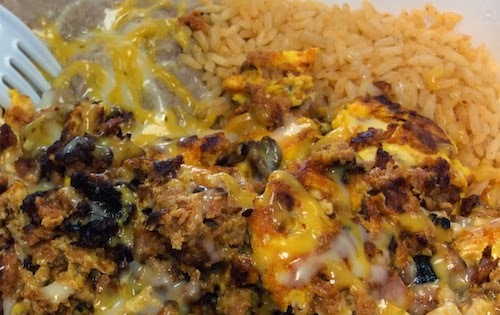 The chorizo was a bit salty for our taste, but still ok. We liked the machaca much better. Naturally, because of the generous portions we received, we saved half for lunch. Guess what? It tastes good cold. We didn't even mind the chorizo's saltiness when it was cold. Just seemed right. Now, all this being said, if you're looking for Mexican food to die for, watch for future posts. Ok, in case you're wondering what this is all about... We often get questions about where to eat near the store. We thought we'd help you out with some ideas. We'll always highlight what's positive about each location, so be sure to listen to what we're saying and what we're not saying. If we consider a place absolutely terrible, we won't even bother writing a post about it, so don't worry about us steering you totally wrong.